Oh meal planning...I'm not gonna lie, it's not my favorite thing. But something that is my favorite, is knowing exactly what I'm making for dinner each night and already having the ingredients on hand. I strongly believe the number one reason people hate cooking dinner is because they don't meal plan. I mean, what's worse than not having dinner ready by 6 because you don't know what to cook, everyone is hungry, tired and you still have to run to the store to grab a few ingredients. We've all been there and it's awful. Meal planning takes away a large amount of stress because you're prepared. I promise it only takes about 20 minutes of your week to meal plan and it will save you time, money and the pain of having to wonder what's for dinner every night. Meal planning also allows you to stay within a budget. Less trips to the grocery store means less money spent. We all know if we're going to the store for one ingredient, we'll come out of there with five things we don't need. You'll soon be able to realize what ingredients stretch your budget so you'll learn to not buy them as often. And of course, the more you cook at home, the less you'll eat out. For a family of four, I spend around $75-$90 a week on groceries alone (this includes restocking pantry items, snacks and meals), which may sound like a lot, but if we were to eat out at a sit-down restaurant for only one night it would cost at least $30-40, which is almost half of what I spend on 7 meals I can cook at home. It's definitely something to think about. This post has been a long time coming and I'm finally motivated to publish it because there are so many of you who want to know how to meal plan. So here are my tips and I hope they help! -Spend a couple times a month looking for new recipes: Scour Pinterest, Instagram, your favorite blogs, cookbooks, and magazines so you'll have stockpile of new recipes to try. -Create a simple place to save recipes: My favorite place to keep and organize recipes is Pinterest. It's so easy to categorize them and quickly browse through the meals that look the most appetizing to you. You can also organize them in a notebook, email and of course in a recipe box or binder. 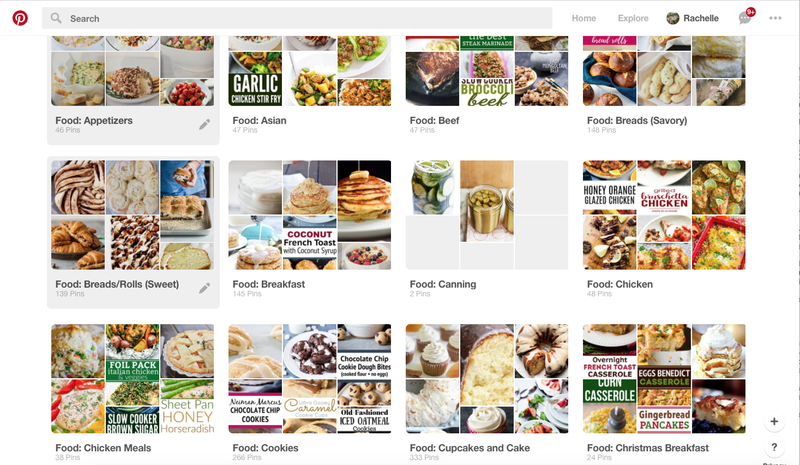 Check out my Pinterest here to see how I organize all of my recipes. ***-Have theme nights: This is my biggest lifesaver. Since I already categorize my recipes on Pinterest, it's so easy to to pick from 7 different categories so we're not having the same type of food every night. For example, one week might consist of Mexican food, salad, soup, homemade pizza, a chicken dish, breakfast and pasta, etc. -Try at least one new recipe a week: This is why I love to cook. I can't imagine eating the same things over and over again throughout the month. While not all recipes come out as good as you hope, I guarantee you'll find some new favorites that you'll make for years to come. -Keep a meal journal of recipes your family loves: I'm a firm believer in trying new recipes, but it's always great to have ones you know will turn out and have ones that your family will actually eat. -Choose a consistent shopping day and make a list: I try to grocery shop every Saturday if I can with a list for the week. This not only saves me time, but money as well because I'm not constantly going to the store to buy more ingredients. -Plan out your meals by checking the weather and your schedule for the week: Make soup on a cold day, grill on a hot one or plan a slow cooker meal for when you know you won't have time to make dinner one night. This makes a huge difference and you can obviously switch the meals around during the week depending on what ingredients need to be used right away or how your day is going. -Plan meals and grocery list around sales and coupons: Check out the sales ad and coupons from your favorite grocery store and plan meals off of it. For example, if hamburger is on sale that week, make spaghetti and meatballs. This is especially helpful with seasonal items like fruits and vegetables. -Plan your meals with rollover ingredients: If you only need 1/2 cup of sour cream for a recipe, plan to make another recipe that uses sour cream as well so you don't waste ingredients. AllRecipes has an ingredient search box that allows you to find recipes using certain ingredients. This is also one of my favorite recipe sites because they all have reviews. -Plan out meals weekly, biweekly or monthly: Whatever schedule works best for you, put meal planning into practice. Weekly is best for me because I like to use a lot of fresh ingredients, but you could do it biweekly or monthly if you prefer. -Make enough for lunch leftovers: This not only saves you time, but a lot of money, too. Also never having to think of what to make for lunch saves my sanity because making lunch is THE WORST. -Prep food for busy days when you have extra time: If you know that chicken needs to be thawed for dinner, thaw it in the fridge the night before or chop veggies the morning of so you don't have to do it later. -Stretch ingredients without starving: For example, you'd be amazed how far one large chicken breast will go. Buy them in a large package, trim them and freeze the ones you're not using this week. Some ingredients can also last into the next week so pay attention to what you have in your fridge. -Don't overstock the fridge: Use what you already have so things don't go bad. If you have too many things in your fridge, things will go unnoticed and you'll basically be throwing money away. -KEEP THINGS SIMPLE: Your meals don't have to be gourmet. Cook what you're comfortable with and branch out when you have some extra time. Not everything has to be homemade. If you don't have time to make rolls, buy them from the bakery or use frozen ones. The reason I love to cook is because I make things I want to and also things I know I'm capable of making. *Meal planning is so important because it's healthier, cheaper and meals eaten at home bring your family together. And what is better than that?